NSB Bank Customers can visit any mCash Retailer point island wide and deposit money to their bank accounts. (Savings and Current accounts). After the deposit customer will receive a SMS confirmation and his money will be updated in the bank account instantly. Even we have allowed third party deposits to NSB Bank Accounts, Anyone with a Valid NIC number can visit mCash Retailer and deposit money to a NSB Account. What are the Bank accounts enabled for this service? What are the locations NSB customers can make a NSB bank account deposit? What are the Locations which are not accepting NSB Deposits at the launch, but will be available Later? What are the extra charges for customer when depositing money at mCash Retailers? No Charges. Service is free. Who are the Retailers has this option to accept NSB Bank deposits? What are the mCash Retailer interfaces can do this NSB Bank deposit transactions? What is the Limit for mCash Retailer on NSB Bank Account Deposit? Is there a Limit for the NSB customer on NSB Bank Account Deposit? Per Transaction / Per Day, for a NSB bank account number customer can deposit maximum Rs.5, 000. Next Day customer can deposit for the same bank account up to another Rs.5, 000. 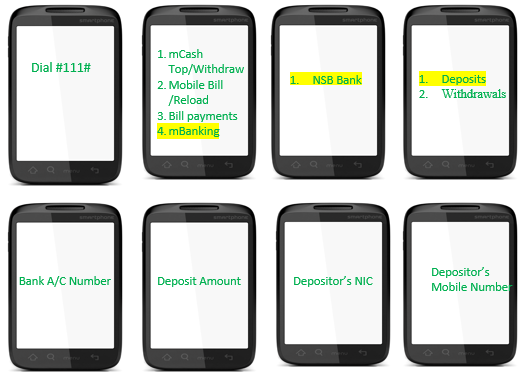 What are the benefits NSB Customer getting by depositing money at a mCash Retailer? · Convenience by having a deposit location near to the customer. · Enjoy Extra Banking hours / can deposit money on Weekends / even Banking Holidays. What a walk in customer should provide in order to make a NSB Deposit at mCash Retailers? What if customer forgot his/her NSB account number? Customer can call NSB Call Centre - 0710 379 379 and give his/her NIC Number NSB Bank will verify few details with the customer and provide the account number to deposit money. How to do a NSB bank account deposit on Retailer USSD Menu? What are the SMS Confirmation Customer receive at the retailer after depositing money? What are the hotline numbers available for customers to make their inquiries / complaints?